Legend has is that , as delegates from across South Carolina gathered to debate seceding from the United States in 1861, the representative from Edisto Island leapt to his feet and declared that if South Carolina did not vote for immediate secession, then, by God, Edisto Island would secede by itself. We all know what happened after that. Even today, Edisto Island has that independent feel. Retiring on the island is a bit like seceding from the rest of the world. It�s not for everybody. But for those who seek an easygoing, secluded lifestyle, there is no better place. Edisto Island is not and will never be a resort island, and that�s fine with the residents of this working island community. There will be no high-rise condominium or hotel developments, chain restaurants or strip malls. Edisto Island does have charming local architecture, mom-and-pop businesses and a friendly, laid-back lifestyle where everything moves just a little bit slower than elsewhere. The outside world is nothing more than background noise that can barely be heard over the sound of the Atlantic Ocean. While the island is secluded�the town of Edisto is 45 miles from Charleston�there is still plenty to do. 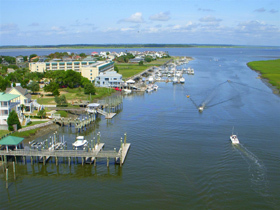 Edisto offers some of the best local cuisine in the area, and there are two marinas and three boat landings to accommodate the many boat owners on the island. The island also is home to a state-operated beach with a historic lighthouse and more than four miles of white sand beach. In the spring and fall, when the temperatures are most pleasant, the tight-knit community organizes numerous events, including art shows and home tours, giving residents a chance to explore the island and get better acquainted with their neighbors. The Edisto Beach Golf Club offers a hacker-friendly environment, a simple but fun course and an easygoing atmosphere. More serious golfers can play the world-renowned courses on neighboring Kiawah and Seabrook islands. Edisto is no resort town, but it is a Nature lover�s paradise. Deer, blue herons and other wildlife are as common on the island as cars, and, when you are down by the water, keep an eye out for dolphins.